Across the world, ecosystems are for sale. ‘Green grabbing’ – the appropriation of land and resources for environmental ends – is an emerging process of deep and growing significance. A vigorous debate on ‘land grabbing’ already highlights instances where ‘green’ credentials are called upon to justify appropriations of land for food or fuel. Yet in other cases, environmental green agendas are the core drivers and goals of grabs. Green grabs may be drivn by biodiversity conservation, biocarbon sequestration, biofuels, ecosystem services or ecotourism, for example. In some cases theyse agendas involve the wholesale alienation of land, and in others the restructuring of rules and authority in the access, use and management of resources that may have profoundly alienating effects. Green grabbing builds on well-known histories of colonial and neo-colonial resource alienation in the name of the environment. Yet it involves novel forms of valuation, commodification and markets for pieces and aspects of nature, and an extraordinary new range of actors and alliances. 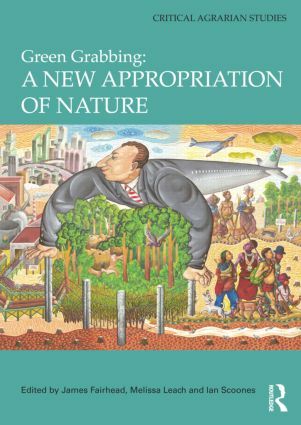 This book draws together seventeen original cases from African, Asian and Latin American settings to ask: To what extent and in what ways do ‘green grabs’ constitute new forms of appropriation of nature? What political and discursive dynamics underpin ‘green grabs’? How and when do appropriations on the ground emerge out of circulations of green capital? What are the implications for ecologies, landscapes and livelihoods? Who is gaining and who is losing? How are agrarian social relations, rights and authority being restructured, and in whose interests? James Fairhead is Chair in Social Anthropology at the University of Sussex and also chairs the Association of Social Anthropologists of the UK and Commonwealth. Melissa Leach is a Professorial Fellow at the Institute of Development Studies, University of Sussex and Director of the ESRC STEPS (Social, Technological and Environmental Pathways to Sustainability) Centre. Ian Scoones is a Professorial Fellow at the Institute of Development Studies, University of Sussex and co-directs the ESRC STEPS (Social, Technological and Environmental Pathways to Sustainability) Centre.